Duterte’s ‘jokes’ reveal a lack of respect for institutions, the rule of law, and the Philippine people. Philippine President Rodrigo Duterte is no stranger to controversy. And over the past few weeks alone, he has once again courted it with his comments about kidnapping and torturing state auditors and abusing a maid, which has made the headlines locally as well as internationally with the usual outcry we have seen over the past few years. But what is striking about all this is not that these controversies continue to recur, but that, in terms of the response from Duterte and some of his supporters, there is an increasing tendency to normalize his controversial remarks by saying that he simply joking or attempting to provide an antidote to political correctness. In fact, these controversies are no laughing matter as they concern the livelihoods of the Philippine people and reflect a worrying tendency of disrespecting institutions and the rule of law. Duterte’s tenure in office thus far has seen a series of occasionally striking remarks and insults and policy declarations that provoke controversy and are then either doubled down on or walked back on by him or his advisers. These include a range of subjects ranging from the war on drugs to the United States’ colonial legacy in the Philippines to the Catholic Church. Though such comments have been interpreted as part of a seemingly neverending line of outrageous remarks by him since coming to power, these are in fact mere symptoms of his seeming disrespect for those he insults and discomfort and disregard for institutions and the rule of law despite the reality that challenging such aspects of Philippine democracy has not gone well for some of his predecessors. An additional notable one was when he warned state auditors that they should be kidnapped and tortured for hampering the work of his administration. “Let’s just kidnap people from COA [Commission on Audit]. Let’s bring them here, then we will torture those sons of w*****,” he declared in a speech to local officials. Duterte and his supporters were quick to step in to try to once again minimize and normalize what he said. The maid abuse remark was said to be concocted and exaggerated. And Duterte himself came out and suggested that we was joking and that he might be doing the country a favor by pushing the boundaries on civility. But these controversies are not a laughing matter. They cannot be dismissed as jokes from the perspective of Duterte’s sense of humor being an acquired taste, or a selfless exercise to help manage a phenomenon of political correctness. In actual fact, they suggest worrying things about Duterte’s disregard for the feelings and welfare of the people he governs and the institutions that support the country he rules. For those familiar with the Philippines, the issue of maid abuse is far from just a personal one. 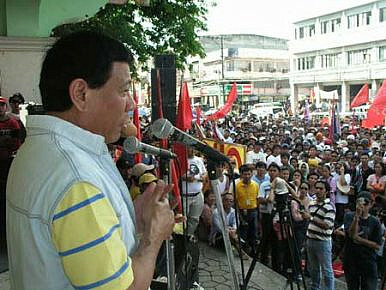 As Jacqueline Ann De Guia, spokesperson for the Commission on Human Rights, rightly noted, given that abuse is a serious problem when the plight of Filipino workers abroad is concerned, it is unclear how the Duterte administration can tout its commitment to uphold the rights of Filipino workers abroad while Duterte makes such remarks about his own conduct at home. “We then encourage the administration to be consistent both in words and deeds in this regard, and refrain from making statements that may contravene its commitment to uphold the rights of Filipino workers abroad, such as the previous remark by the President claiming to have abused a female domestic worker during his teenage years,” De Guia said. In the case of state auditors, this is a serious issue because the COA is responsible for scrutinizing government agencies and their evidence can result in corrupt officials being sent to jail. The COA is supposed to question what a president’s agencies want, check their books, and preserve a reputation for doing their best while remaining independent. This is symptomatic of a leader who does not respect the constraining power of institutions on individuals, which is to be expected in a democratic system. For those who know the Philippines well, while there are no doubt issues with how that system works, what the country needs, as evidenced from a number of lingering issues including extrajudicial killings and corruption, is more hard work from institutions and greater dedication to the rule of law, rather than less of it. Duterte’s failure to understand this is no laughing matter either. Former presidents Gloria Macapagal Arroyo, Joseph Estrada, and Ferdinand Marcos all saw their legacies contested and ruined by a mix of legal scrutiny or popular uprising because they too attempted to place themselves above institutions and the rule of law. Duterte could well suffer the same fate if he does not take this seriously.